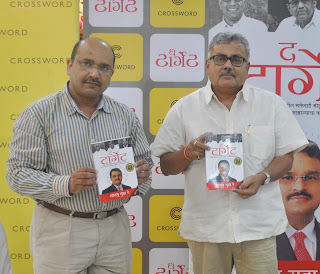 PUNE: Marathi version of popular book, The Target by Senior Journalist Shantanu Guha Ray was published at an event in the city recently. The book was published at the hands of Mukund Sangoram, Deputy Editor, Loksatta. Manish Purohit, Founder, Authors UPFRONT was also present during the event. The Target, an investigative narrative by senior journalist Shantanu Guha Ray on the NSEL crisis, It is a very systematic and meticulous investigation by Shantanu Guha Ray that unveils the devious ploys of vested interests that shunted Jignesh Shah out of the Exchange ecosystem.